Ambient lighting — that is, light sources that have strictly functional and no decorative purpose — can match your TV stands with LED lights shade. This way, the room will acquire a very logical and easy to follow environment, even though the entire arrangement will not catch the eye — it will just look natural. Not all TV stands with LED lights have only distinct LED shade — sometimes, one piece can have up to five interchangeable colours. If you are looking for decoration solutions that will give your living room a ‘flexible’ look and will allow you to go with the mood, you should definitely consider a stand like this. In most late 2015 furniture collections, different shades of blue soft furniture upholstery are one of the dominant ones. Combined with a blue highlighted TV stands, a blue sofa will give the room a nice and welcoming look. 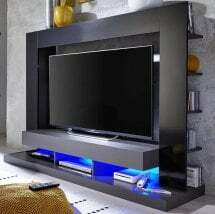 Some of the most impressive TV stands with LED lights also come with tempered glass shelves. Moreover, the shelves are generally highlighted by LEDs. Another tempered glass unit in a living room — a coffee table, for example — will make the whole interior logical and impressive. 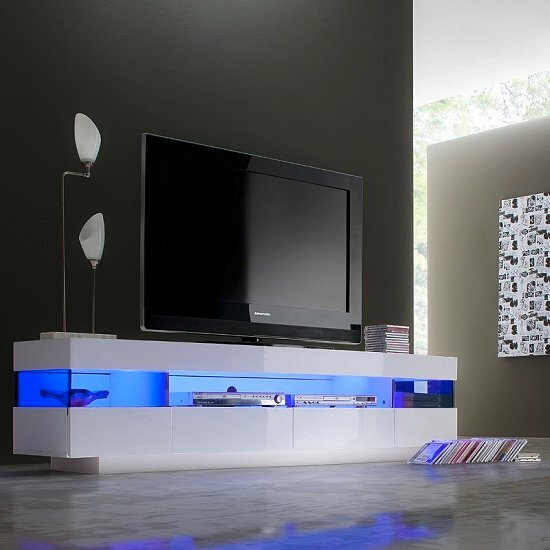 One more incredibly memorable example of TV stands with LED lights are TV stands in high gloss. This stylish shiny finish has been overwhelmingly popular in the last couple of years, and the tendency still preserves its relevance. Perfect for modern rooms, high gloss furniture comes in many different colours, offering you a chance not only to make the room time relevant, but also to work on memorable interior contrasts. Another simple way to create contrasts in the room is to go with a piece that is already contrasting. A combination of black and white is the most popular one; however, other variations are also possible. Still, one of the easiest ways to make your room interior memorable — especially if you are working on it from scratch — is to furnish it with another LED highlighted unit. It can be a coffee table, a display stand, a sideboard — the choice of furniture with LED lights is quite impressive.